Mergers and acquisitions rebounded in 2010, and the momentum appears to be carrying over into this year. 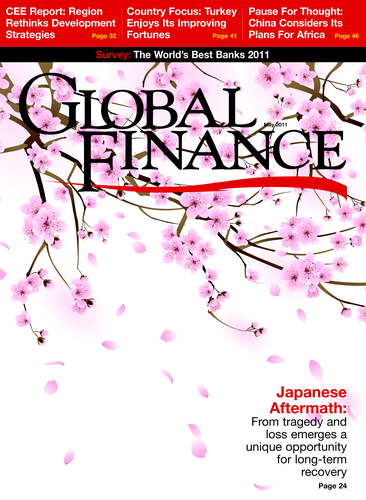 The first three months of 2011 constituted the strongest quarter for mergers and acquisitions globally since the second quarter of 2008, according to Thomson Reuters. Some $800 billion of deals were announced in the first quarter, an increase of 55% from the same period a year earlier. 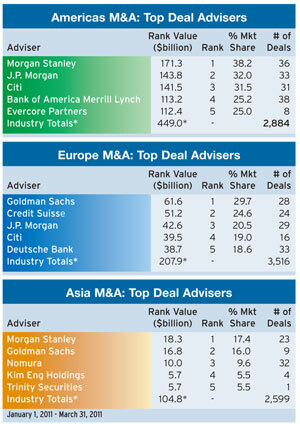 Morgan Stanley was the number-one financial adviser on worldwide deals announced in the first quarter. The investment bank advised on 81 deals valued at $215 billion, giving it a market share of 26.8%. 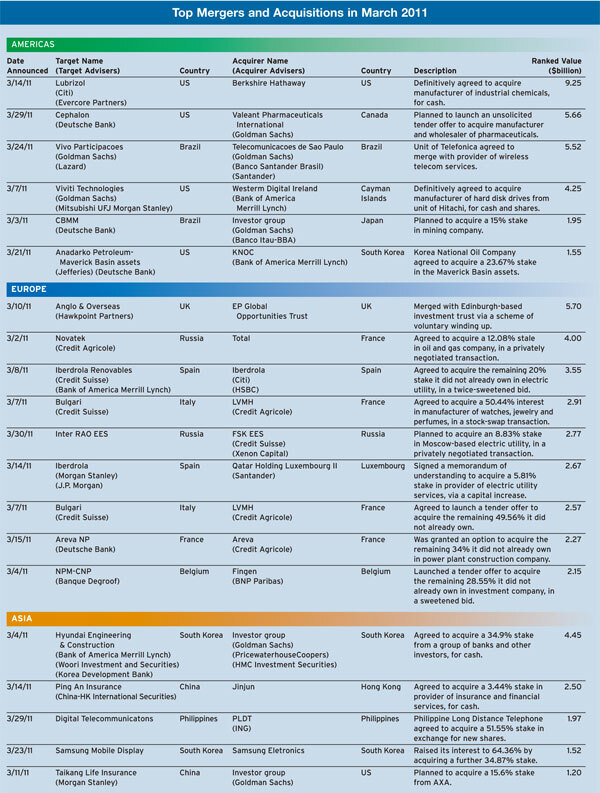 J.P. Morgan was second, with 77 deals valued at $195 billion. Rounding out the top five financial advisers, as ranked by Thomson Reuters, were Citi, Goldman Sachs and Bank of America Merrill Lynch, in that order. Morgan Stanley benefited from its role as lead underwriter for the conversion of the US Treasury’s $59 billion of American International Group’s preferred stock into common shares, which was the largest deal in the first quarter of this year. Morgan Stanley also advised Deutsche Telekom on its $39 billion sale of T-Mobile USA to AT&T;, the second largest deal announced in the first quarter. The energy and power sector was the most active arena for M&A; transactions in the latest quarter, led by the $26 billion proposed merger of North Carolina–based electric power producers Duke Energy, based in Charlotte, and Progress Energy, based in Raleigh. BP was involved in two of the largest deals in the energy sector. The UK-based oil company agreed to acquire 23 oil production-sharing contracts from India-based conglomerate Reliance Industries for $9 billion. BP also agreed to invest $7.9 billion in an alliance with Russian state-owned oil company, Rosneft. The Russian deal was looking more uncertain as Global Finance went to press, however, after Rosneft announced it would probably have to replace BP with another partner in its venture to develop Arctic oil fields. BP’s Russian partners in another joint venture, TNK-BP, were trying to block the Rosneft deal. Meanwhile, France-based Total agreed to pay $4 billion to purchase a 12% stake in independent Russian gas producer, Novatek, and to join the Yamal LNG project in northern Siberia. Controversy also surrounded the largest M&A; deal announced in March, Berkshire Hathaway’s $9.25 billion purchase of Lubrizol, which makes petroleum additives and lubricants. David Sokol, who was once considered a leading candidate to replace Warren Buffett at the helm of Berkshire Hathaway, resigned from the company in late March. Sokol bought 96,060 Lubrizol shares in January, less than two weeks before recommending the firm as a Berkshire Hathaway takeover target. Buffett said he believes Sokol’s trades were legal. Sokol was chairman of several Berkshire subsidiaries, including MidAmerican Holding and Johns Manville, as well as chairman and CEO of NetJets, a Columbus, Ohio–based firm that arranges fractional ownership interests in private aircraft. By purchasing Lubrizol, Berkshire was betting on sustained industrial growth in emerging markets. Petroleum additives, which are popular in developing countries, account for approximately 72% of Lubrizol’s revenue. Valeant Pharmaceuticals International, Canada’s largest drug manufacturer, launched a $5.7 billion hostile takeover bid for Cephalon, a Frazer, Pennsylvania–based company that makes sleep and pain medications. Valeant said it went ahead with the cash offer after Cephalon rejected its private approaches. Valeant announced on February 1 that it would buy PharmaSwiss, based in Zug, Switzerland, for $480 million to expand in Europe.